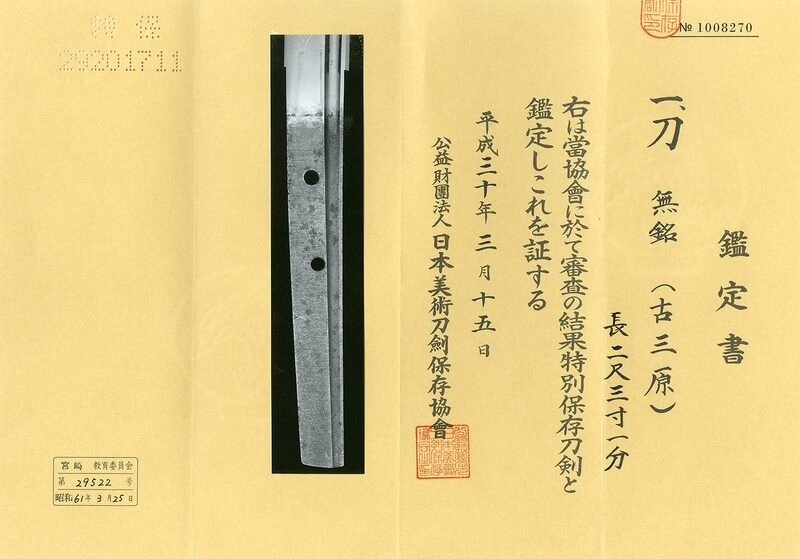 Blade length : 70.0 cm or 27.6 inches. Width at the hamachi : 2.98 cm or 1.17 nches. Kasane : 0.6 cm or 0.24 inches. and thick with deep sori and medium Kissaki. and engraved Bo-Hi on both sides of the blade. with jinie attach backishi jigane and Utsuri appear on the Ji. Hamon :Konie deki suguha and soft feeling nioikuchi hamon. but at this time, the sword was said as Komihara. I think his judge must be better answer. and recommend the sword for you. If you ask us to make Koshiraem please let us know.